What are Search Network Only Campaigns? Why Use Search Network Only Campaigns? This guide is an introduction to Search Network Only Campaigns, how they work, what they are used for and the components specific to them. We do not cover any features or components that are used across all campaigns, such as budget, campaign name, etc. Search campaigns are campaigns that allow ads to be displayed on the ‘Search Network’, which in layman’s terms means; the ads that show when someone searches in Google for a keyword or related term contained within the campaign. This means that ads contained in a Search Network Only Campaign will appear within the SERPs (Search Engine Result Pages). 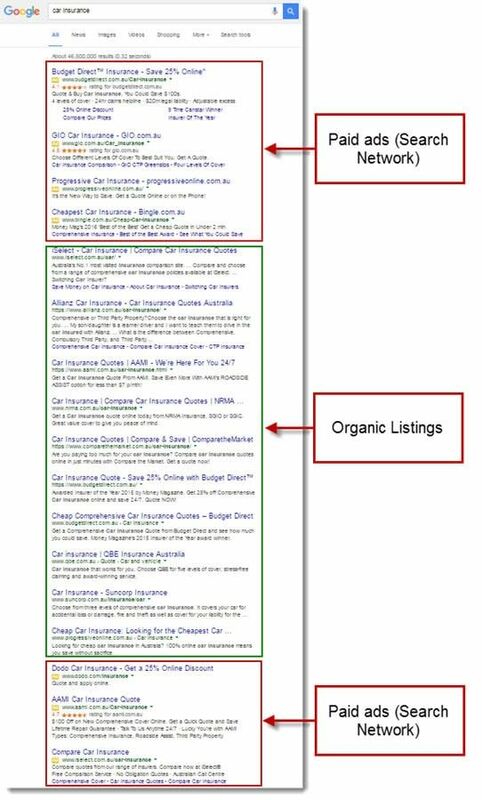 The image below shows the SERPs and we have highlighted how and where Search Network Campaign ads will show. As you can see, there are four ads at the top of the page above the organic results and three ads beneath the organic results. Organic results are the non-paid search results. Ads can vary in appearance depending on how they are constructed and the position that they appear in. But no matter how they may differ all of the ads in this image are Search Network ads. Search Network ads cannot be images, shopping products, or videos, they can use only text ads. These are the most basic / standard campaign type and also the one that people are typically most familiar with. They are the easiest campaigns to setup and manage which makes them attractive to beginners and new users. The Search Network is a powerful marketing channel allowing you to meet users with ads at the point when they are actively searching for your products, services, or content. The Search Network is a highly effective ROI (Return on Investment) channel, allowing businesses to both generate revenue, profit and measure this to a very granular level. Due to the direct response nature of these campaigns they typically have higher conversion rates than all other campaign types, with the exception of shopping campaigns. But if you do not have a shop, these will likely be the leading source of conversions and revenue, when compared to other campaign types. 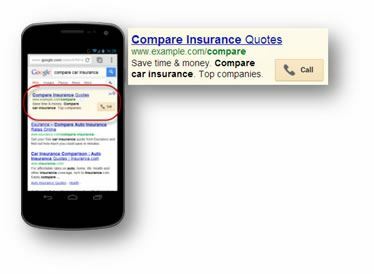 Search Standard campaigns allow you to show text ads in Google’s search results and (if selected) on Google Search Partner sites. With this campaign sub-type, you will have access to all of the standard settings, mobile settings, ad rotation and delivery methods as well as ad extensions. If you'd like to take advantage of Google’s search network and search partners as well as creating simple text ads, this is a good campaign type to choose. Enabling or choosing the all features campaign sub-type, as you might expect, enables all of the features available on the Search Network Only Campaign type. This allows you to use the entire suite of ad formats such as call only, dynamic search ads, and mobile app engagement ads as well as the standard text ad. Who should use it: If you want to reach customers on Google search and our network of search partners and want access to all available AdWords features within search, this is a good option for you. Mobile app installs campaigns both allow and encourage people to download your app by directing them to your download page within the app store, from clicking your ads. The section below covers more detail about Mobile App sub-types, all of the features available on this sub-type are available on the Mobile App Engagement sub-type. As well as advertising on the Google Search Network you can also advertise within Google Play using the sub-type. The aim or purpose of this campaign sub-type is to allow advertisers to reach people that have your app, encouraging them to use the app when they are searching for something relevant to the nature of the app. But for those people who do not have your app, this allows them to install the app on their Android phone (this only applies to Android devices). Ads that use these sub-type take users directly to your app install page from clicking your ad. By linking your Google Play Developer Account, you will find it much easier to create these campaigns and manage them efficiently. Google provide a keyword generator for ad groups when creating this type of campaign, you can enter a sample keyword into the generator. You can generate more keywords at any time by returning to the keyword tab. We cover bidding strategies elsewhere in this guide, all bidding strategies available for Search campaigns is also available for Mobile App Engagement and Install campaign sub-types. To find out more about Mobile App Engagement, please follow the link. Dynamic Search campaigns are a relatively new feature that uses the content on your site to target users automatically without the need for keywords. This enables you to scale your campaigns more efficiently or fill gaps in the targeting of keywords. We discuss this in more detail later in this guide. 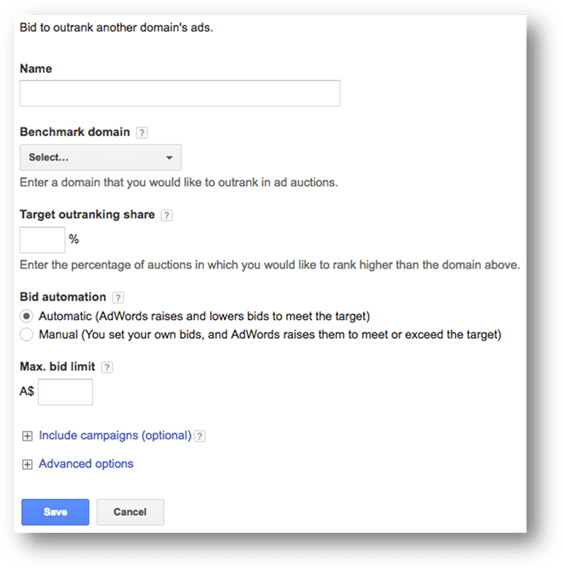 Bidding is still managed on a CPC basis by default and all of the bidding strategies in this guide are available for dynamic search campaigns. Call only campaigns are designed to encourage users to call your business, the ads used in these campaigns appear only on mobile devices and provide a click to call feature. Using this sub-type limits the use of ads to call only ads and is charged on a cost per call, in the same way that cost per click works. Using Google’s forwarding service allows you to track calls to your business and thus enables granular reporting around this. To find out more about Call Only Ads, please follow the link. We have listed all of the ad types available on Search Network campaigns across all campaign sub types below. Texts ads are clickable links that deliver traffic to your website. Ads are the account components that are shown to users / searchers making them unique in that respect. All other account components, such as keywords, campaigns, ad groups, etc are not things people can see. For more information on text ads, please follow the link. For more information on dynamic search ads, please follow the link. This ad type is designed to target people searching on mobile devices capable of making calls directly from ads. These are custom built for people trying to drive phone calls to their business; the “call” button (see image below) makes it even easier for users to connect with your business. For more information on call only ads, please follow the link. These are basically text ads that direct users to an app install page or promote the use of your apps on user’s Android phones. For more information on mobile app engagement ads, please follow the link. We describe here only the bid strategies that are available on Search Network Only Campaigns in this section of the guide. Different bidding strategies provide their own advantages and disadvantages but are typically designed to meet specific need of the advertiser, or make it easier for them. There is no right or wrong bid strategy, for the most part, rather its which is appropriate or eligible for you to use. Some bid strategies are ‘pre-sets’ that can be selected and applied easily but there is also a range of custom bid strategies that can be, as the name suggests, customised. Bid strategies can be applied to ad groups, campaigns and keywords. You can learn more about bidding strategies by following the link. Again it is worth noting that this is not always accurate, not always relevant or applicable to every campaign (even if it is tracking revenue or conversion values). There is a period of learning that can vary from one to six weeks and optimal performance may not result in hitting the ROAS target. Unless you choose to run dynamic search ads, you will be using keywords to target your audience on the search network. We cover all of the targeting options unique to Search Campaigns below. Bear in mind that there are other bidding strategies available at the ad group or keyword level that cannot be set from the Campaign level. Keywords are arguably the most intrinsic part of any Search campaign, they are what will trigger or not trigger your ads. Keywords sit within ad groups along with ads… It is the keywords in an ad group that will trigger the ads in the same ad group. Thus there arises an obvious need to keep these components closely knit to maximise on their relevance to each other. There are three main types of keyword with a fourth variation on one of those types, we discuss each below, we also discuss match types in more detail in another guide. Negative keywords work in the opposite way to keywords, instead of triggering ads, they prevent from being triggered (shown). In many other respects negative keywords work in the same way as keywords, we discuss how they work and why they are essential in most accounts in this guide. Negative keywords prevent ads from triggering when the negative keyword matches (based on match type) a search term that would otherwise have triggered one of your ads. Negative keywords reduce Impressions by restricting when or where your ads can show, depending on what network they are being used on. It is possible to add remarketing list audiences to search network campaigns and use these in conjunction with other targeting methods such as keywords or dynamic search ads. This targeting option allows you to set bids for users who have previously visited your site and are currently in a remarketing list… Thus allowing you to target them on the Search Network rather than how it’s traditionally targeted on the display network. There are various components that you will need to have in place before you can use this targeting option… You will need to have installed the remarketing tracking code to each page you want to track users on (typically this is all pages). Once installed you will need to create remarketing lists and wait for these to be propagated with data. This is a powerful tool and requires a more in depth description, as there are various options that can affect how the RLSA ads will operate. We cover remarketing lists for search ads in more depth in another guide. Search Network campaigns can use Dynamic Search Ads, which we cover in more depth in another guide on Dynamic Search Ads. You can use dynamic search ads in the same Search campaign using keywords to target users. We typically split these out into separate campaigns for reporting and analysis purposes. Dynamic search uses your website content to automatically create text ad headlines and landing pages. This is great for filling in gaps in your keyword strategy or identifying new search terms. Rather than using keywords to target users, Google’s organic algorithm used in ranking websites can be used to match page content to search terms. You can see the search terms that resulted in a click within AdWords and use these to either target with keywords or exclude as negative keywords. Using the same categories available for targeting users through dynamic search criteria, you can exclude specific or broad criteria. YouTube and other Google sites. Shopping campaigns differ in that your PLAs can appear on partner sites that show and link to products that you have for sale on your site. Search partners are included within Search Network campaigns by default, but you can choose not to show your ads on search partners by deselecting the "Include search partners" checkbox as you create a campaign. If you choose not to select "Include search partners", then your ads are will only show on Google Search and ‘Shopping’. Click-through rate (CTR) is a huge factor in determining quality score, but the CTR of ads appearing on the search partner sites doesn't affect your Quality Score on Google.com. 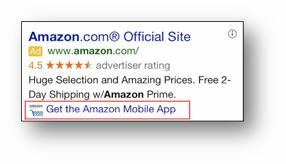 Ad extensions provide users with more reasons to click on your ad and more locations on the ad to click. They also help to provide additional information relevant to the searcher. Ad Extensions come at no extra costs, you will be charged for the Clicks but at no additional cost to what you would pay for a click normally. By providing additional information about your business, products, what your customers think, etc to searchers you can encourage people to click on your ads. We cover below only those ad extensions available on Search Network Only campaigns and all of the campaign sub-types, to know more about this topic please read our guide to ad extensions. As the name suggests, these are extensions that require you to set them up and manage manually. Location extensions provide the functionality to include information about the location of your business. 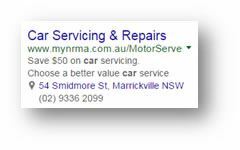 You will need to link a ‘Google Places’ / ‘Google My Business’ account to the AdWords account in order to include this information in your text ads. Sitelinks are probably the most common type of ad extension, adding clickable links, to web pages, relevant to the ad with short descriptions. You can create loads of sitelinks typically to different product or service pages, category pages, special offers, etc. Call extensions add a phone number to your text ads; this can be a clickable link for mobile users and encourages users to call your business. Review extensions are quotes or paraphrased quotes from third party sources saying something about your business. These appear below the ad in quotation marks and are supported by a clickable link to the source of the quote. Because review extensions are not links, you will not be charged for them specifically, you will simply be charged for a click on the add (at no extra cost). ‘Callouts’ are, as the name suggests, an opportunity to call-out your selling points, services, offerings, etc. 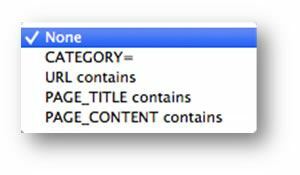 Similar to sitelinks except that they are not clickable links, they can however appear with other extensions. 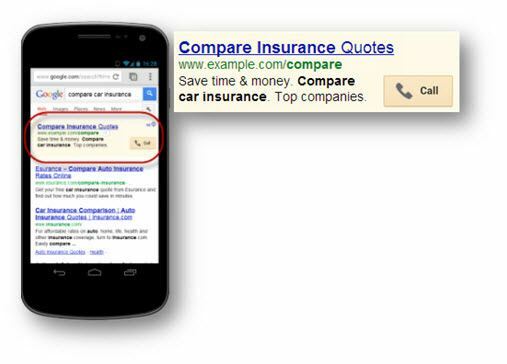 Structured snippets allow you to show information specific to your products and services to searchers in your text ads. In the example below, we searched for “men’s shampoos” and the ad (see below) appeared with ‘types’ of shampoo that they offer and may be relevant to the search. These extensions are used to promote tablet or mobile apps by providing a link in the ad. The link in the ad can be setup to either direct a user to a description in the app store (Apple store or Google Play) or to download the app directly to the device. Automated extensions appear, as the name suggests, automatically on your ads. These follow the same format for the corresponding manual extension version. You can see how these extensions perform by seeing the Automated Extension Report in AdWords. These require no setup and highlight industry specific ratings / consumer survey data from independent 3rd party sites. These only appear on ads for businesses that Google have surveyed the customers of, if they have this data then it may show, if they do not then it won’t show. You can opt out of this if you so choose by Consumer Ratings often enhance CTR. ‘Previous Visits’ allows past site visitors to find their way back to your site and as such can improve CTR. Seller ratings appear automatically in ads where Google have collected data about your business from your customers. Dynamic Sitelink Extensions show links to relevant parts of your site underneath your ad. This provides more clickable links and options for searchers, thus increasing the potential for Clicks. The below is an example of how this can appear. We cover sitelinks in the manual extensions list above, all of the benefits are the same for this as for those. Dynamic Structured Snippets are the automated version of ‘structured snippets’ described in the above section on manual extensions. These provide additional specific information relevant to the search in your ads. Dynamic Structured Snippets are free as they do not provide a clickable link to the user. If you would like to opt out of this feature, complete this form.